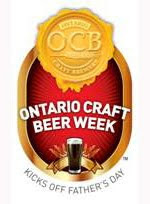 The third annual ‘Ontario Craft Beer Week’ launches on Father’s Day, running from June 17 – 23, 2012 throughout the province. The annual week-long, beer-themed salute to Ontario’s small, independent brewers celebrates the burgeoning local craft beer scene, exposing consumers to the fun and fresh quality of Ontario’s homespun brews. Hosted by 29 OCB member breweries, hundreds of beer-themed, grassroots events will be held throughout the province in breweries, pubs, restaurants, event venues and service clubs from Cambridge to Van Kleek Hill and Muskoka to Niagara. The festival continues to grow in size and scope and promises plenty of unique beer-tasting opportunities. OCB is also pleased to announce that Amsterdam and Steam Whistle have joined the festivities this year. Highlighted under a banner theme of “Your First Time”, this year’s festival will focus on newbies and naysayers, encouraging people to try new local beer flavours, styles and brands and report on their experiences using social media like Facebook, Twitter, Foursquare, etc. Events throughout the week include tasting opportunities at pubs and restaurants, craft beer 101 courses, beer and food/cheese/chocolate matching, meet the brewer, pub crawls, collaborative/competitive brewing, indie beer & music appreciation, and much more. Many of the OCB members will kick off the week with Father’s Day celebrations at their breweries or on premise with local licensee partners. In Toronto, the week is bookended by such large scale gatherings as the Toronto Wine & Spirits Festival, Beach BBQ & Brews Festival at Woodbine Park and the week finishes up with SESSION 99, A Craft Beer Festival at 99 Sudbury. Last year’s Ontario Craft Beer Week saw 23 breweries hold 120+ events in 25+ towns and cities across the province. Any interested parties with event ideas or requests should contact their local brewery or send an email to info@ocbweek.ca .